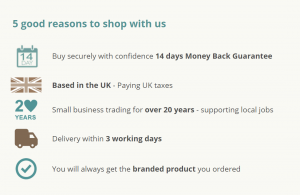 We operate a no quibbles 14 day returns policy - so if when your kitchenware arrives it is not as expected, all we ask is that you return the item to us in a re-saleable condition and in undamaged packaging. If you wish to return your kitchenware to us because it is damaged we require you notify us on the day of delivery that there is a problem and indicate whether you want a replacement or a refund. Please email customerservices@thebigkitchen.co.uk to notify us of any damage. If you have any questions/comments about our returns policy, you should email info@thebigkitchen.co.uk.